Cloud storage has given us the ability to access files and documents from anywhere. Even more conveniently, some services allow us to add, edit, and share said files while anywhere in the world. 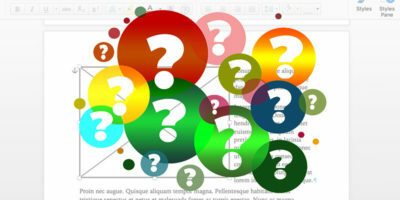 Google Docs has always been a popular choice for those who want to access and share documents with ease. 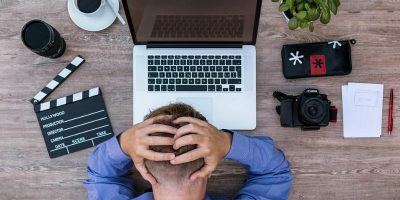 No matter how useful cloud documents can be, however, sometimes you want to convert it to a tried-and-true format, such as DOCX. 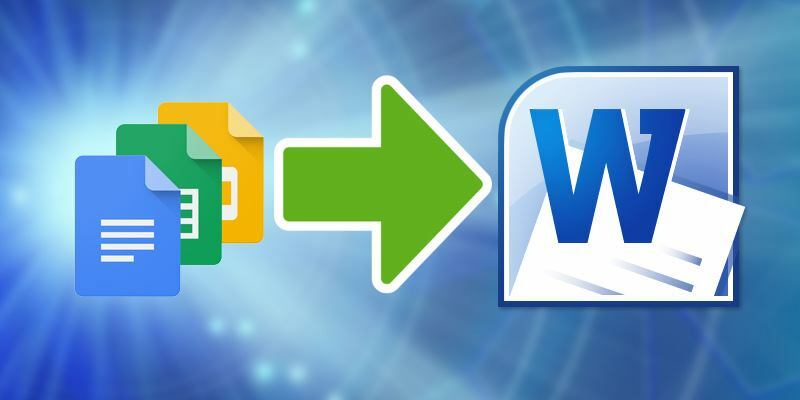 If you have a document stored in Google Docs and you’d like to download an offline copy, it’s easy to convert Google Docs to Word format. 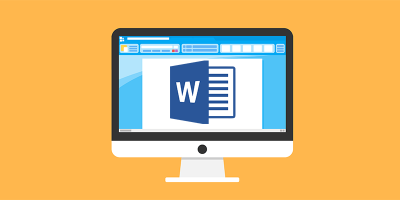 Note: while you can convert documents from Google Docs to Word, there is no guarantee that the formatting in your document will be preserved during the conversion. Because Google Docs are in an online format, we can’t just import them into Word! In order to use them within Microsoft Word, we’re going to need to convert Google Docs to Word’s DOCX format, then download it afterward. You can easily perform this conversion from both Google Docs and Google Drive. You’ll see a list of options appear within this menu. As you can see, conversion to Word documents isn’t the only thing Google Docs can do! 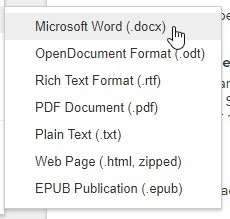 If you’re ever in the need to download a Google Doc as a PDF, or even convert one into the EPUB ebook format, you can come back to this menu and do that. For now, however, we’ll click the “Microsoft Word” option. 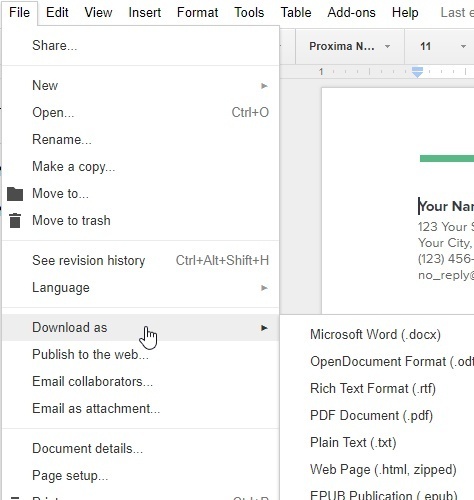 Google Docs will open a “Save As…” window where you can select where you want to save the document. 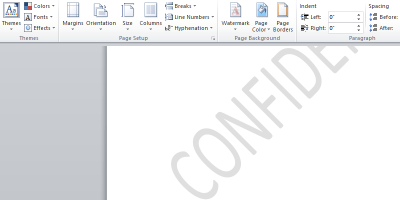 Once saved to a memorable location, you’ll be able to open the file in Microsoft Word. For Google Drive it’s even easier to perform this conversion. 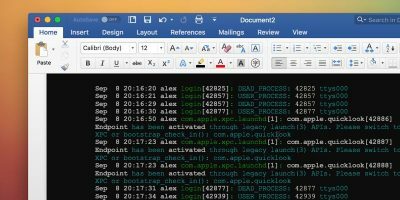 You won’t be able to perform a conversion to other formats (like PDF and EPUB) in Drive, but if you’re just after a Word document, this method works perfectly fine. Google Drive will automatically convert it to a Word format and open up a “Save As…” window to save it. Sometimes you don’t want to save just one document as a DOCX file. 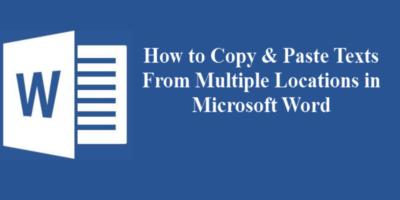 Sometimes you want to convert multiple Google Docs into Word documents all at the same time. Unfortunately, because the Google Docs method relies on you entering each document to download it, it’s a little time consuming to download them all. However, because Drive performs its conversion through a right-click menu on the main page, we can do it there instead for a much faster and easier experience. Then, right-click any of the highlighted ones and click “Download” as normal. 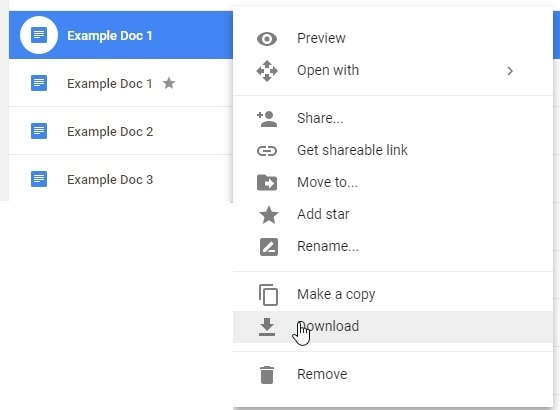 When you click this, Google Drive will convert all the documents selected, then pack them into a ZIP file. When it’s done, it’ll give you the ZIP file to download. Just save this somewhere memorable and unzip it to access all of your files. Despite all the benefits of cloud storage, sometimes you just need an offline copy of your documents. With a few clicks, you can convert Google Docs to Word files with very little hassle. 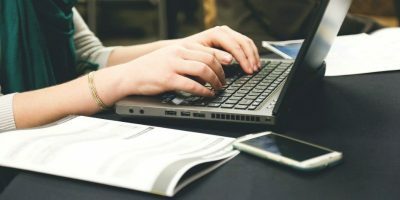 How much do you find yourself using cloud-based documents over “physical” ones? Let us know below! 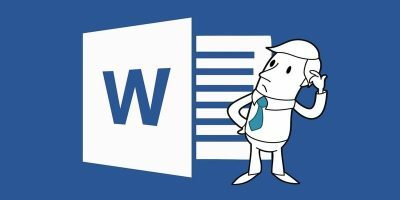 Article states: “Note: while you can convert documents from Google Docs to Word, there is no guarantee that the formatting in your document will be preserved during the conversion.” The problem *is* inconsistent formatting. After research and testing I have found a way to export from Google Doc to Word while preserving the formatting. The approach I’m using is to save as RTF rather than DOCX, and then convert RTF to DOCX using MS Word (to reduce the file size). Also, for the text which appears on a shaded background (such as in tables) I have modified in Google Doc to explicitly shade the text background to match the table background.